After cabbie Oumar Maiga said his night was "a little hectic, but not bad," the passenger was serious when he replied "I'll make it a great night." 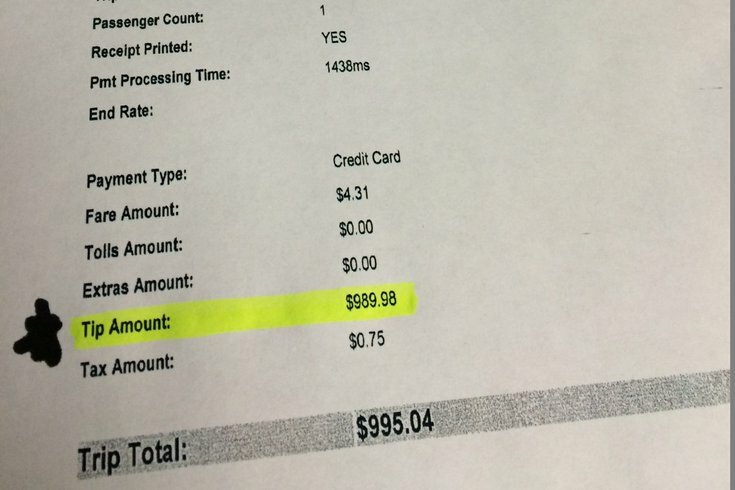 The trip was less than a mile — from Old City to an apartment on Columbus Boulevard — but the passenger tacked on $989.98 to his $4.31 cab fare. When Maiga, a transplant from West Africa, asked the passenger if he meant to tip that much on his card, the passenger said "I know what I did." Maiga's has been with Freedom Taxi since it was founded in 2011 — and his bosses said he's very deserving of the massive tip, philly.com reported. "He's a quintessential taxi driver," [Freedom Taxi co-owner Everett M.] Abitbol said. "He works six or seven days a week and is very consistent. He works very hard to put food on the table for his family and sends a good amount of that money to family that remain overseas." The tip was given on Dec. 13, but Abitbol said the company waited a month to ensure the tip went through before they broke the news via their Facebook and blog. Philly.com was not able to reach Maiga for comment. The identity of the large tipper remains a mystery.